I'm a hopeless Yuuko/Watanuki shipper, so I had to vector this beautiful scan! I know, the background isn't very imaginative, but I like the result.. I like the whole scene, looks very peaceful and beautiful. You vectored the scan very nicely as well. Other than the tree needing a little more work, it's a wonderful wallpaper. Keep it up. Two items of animation should be decided. Very nice vectoring. The bg is nice too, it fits the Yuuko and Watanuki's expressions, adding to the peaceful atmosphere. I rather like this wallpaper. 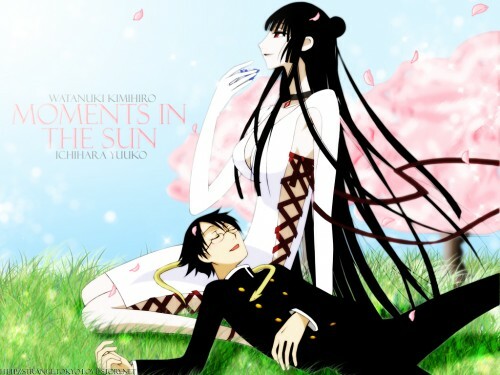 Yuuko looks very serene and thoughtful while Watanuki looks very relaxed and carefree. The wallpaper does look a bit better without the cherry trees (they look a little like cotton candy or pink clouds). It does give a carefree attitude to the image, though... but I prefer the no cherry trees. Haha i think that the cherry trees look like cotton candy xD so cute. I like the use of pastel colours here ^^ good work- much nicer than the original scan. Although I'm not a WataYuuko shipper, I am thoroughly enjoying this wallie. cool i love watayuuko couple. This is one of the cutest XXXHolic wallpapers I've ever seen, too bad that it's only 1024x768 :( but I still love it :) . Woow how beautiful and romantic relax on the sun,i simply love this background and this vector!Very wondeeful! Je suis totalement fan! J'adore Yuuko! The images on this site are the best of anywhere! Just Beautiful!